In an earlier post I mentioned (I say mentioned, the whole post was pretty much centred around it), that at the end of August, it will be my twenty seventh birthday. Now, since then I’ve been having a little think. This new age means that there will only be three years until I am thirty. Three years. Only three years. This is some scary sh*t.
So here is my bucket list, it’s going to be available on a separate page of my blog so you can keep a track of how I’m getting on. I’ve gone for a hundred things because it seems quite a popular number with most other bucket lists... If you can’t beat them join them. Get a rescue dog, or maybe two. I absolutely agree with owning my own business. I was 26 this year, I also feel that need to start listing stuff to do...top of my list though, is I want to be a fully self-employed, not working for anyone but me, wedding photographer by the time I am 30. Got 3 1/2 years to go... GONNA DO IT! Good luck with your list- sounds like you need to take a year out to go travelling!! Donating blood is on my bucket list, too! I just see it as something so easy to do that makes such a difference. Love the redesign of your blog, it looks gorgeous! Such an awesome list! I wrote a bucket list when I started uni 3 years ago and have recently rediscovered it! It was so awesome to go through and cross off the things I have managed to do! :) have fun completing your list! I love your list. I definitely want to visit those places too. I've never actually written down an entire list of what I would like to accomplish, it's not a bad idea! That is such a good idea to make a bucket list - I think I may have to do one. I know, it's a massive fear haha, it's just that little bit closer to thirty, it's just so scary!! 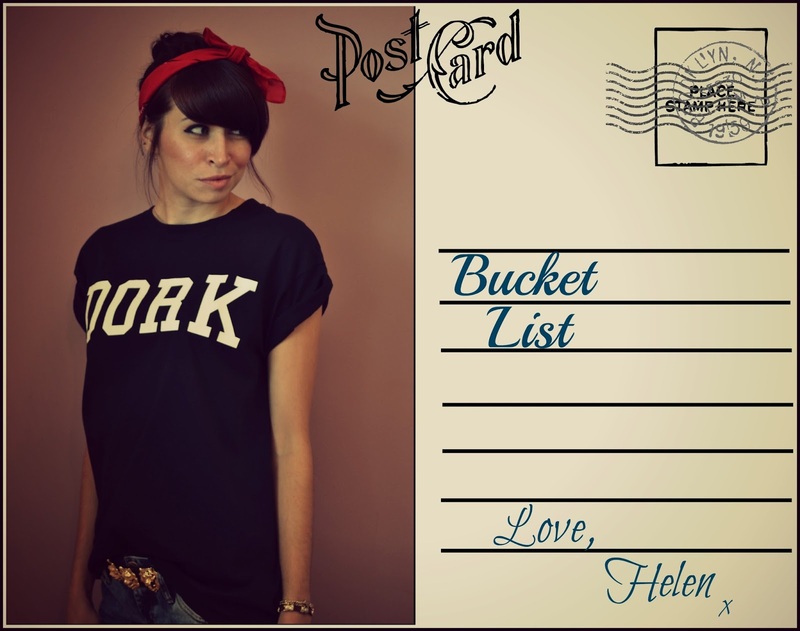 I have a bucket list on my blog, if you haven't already you could look at some ideas from there! You have so many ideas, I love the idea of riding an elephant... I may just add that to mine if you don't mind? I want to own my own little library in my house with a cosy armchair and piles of books everywhere - and read over 500 books! I love your blog!